A masterpiece for the discerning few. 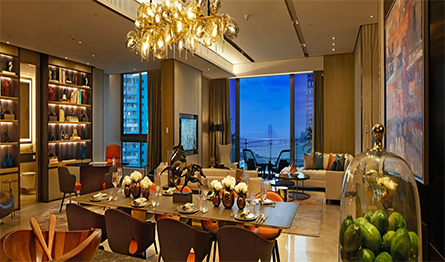 Artesia by K Raheja Corp is an iconic stand-alone tower with views of the Arabian Sea and the Bandra-Worli Sea Link. - It is curated around the distinctive offerings of exclusivity, privacy and the congregation of like-minded people. - A pinnacle of bespoke luxury residences for an iconic lifestyle that juxtaposes ultra-modern amenities with flawless elegance. Note: Artesia-Residential Wing” is being developed by Promoter/Developer, K. Raheja Private Limited (a ‘K. Raheja Corp group’ company) having MahaRERA Reg. No. P51900000841 – (https://maharera.mahaonline.gov.in/). The images depicted herein are actual images of project.The Furniture and fixtures (save and except sanitary fittings as may be agreed to be provided) are not part of the standard offering. The list of standard offerings,amenities and other details are available for verification at site. Intending purchasers are requested to verify all details before acting in any manner with respect to Project. The project is funded by HDFC Ltd. No Objection letter would be obtained at the relevant time, when required. Sea Facing Uber Luxurious residences with bespoke designs of Martin Kemp. Residences with Project and Clubhouse amenities to make your weekends more fun-filled. The content herein is intended to only provide a brief overview of the residential projects of KRC, and not to advertise, market, book, sell or offer for sale, or invite anyone to purchase any premises / property or enter into any transaction. Various concepts, content, data, material or services (if any) that maybe depicted presently, and, from time to time hereafter in the Websites (including details, designs, elevations, images and other visuals and wordings) may be actual images or artist`s impressions or stock images, which would be illustrative, limited, provisional and subject to variation. The Websites may be updated on a periodic basis, without any obligation or intimation. The user/s shall independently inquire, verify and inspect all details, including the property and all relevant documentation, and, wherever required seek appropriate legal, financial and technical advice, prior to acting in any manner in relation to any KRC residential project. For more information on any specific registered projects which are advertised, marketed or offered for sale, please refer to the website of the concerned residential project as registered with respective state Real Estate Regulatory Authority; as also contact the concerned KRC company.